Melissa and Joe had a great idea for their engagement session. They wanted to start at the Niagara Falls Gorge Scenic trail. They lived right near there and said they would go all of the time. Then they wanted photos done at their house! 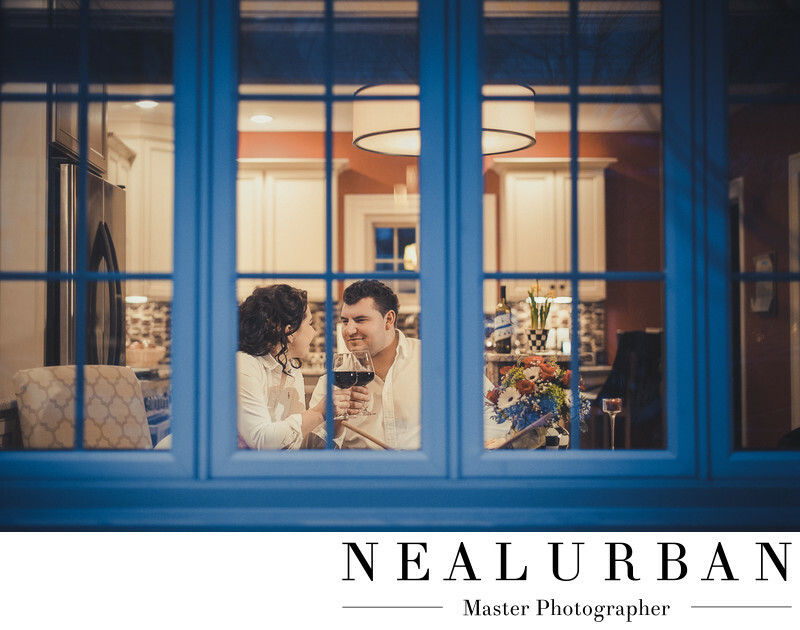 This newly engaged couple had just remodeled their kitchen and wanted to use it for some photos. They like to cook and entertain together, so that was the plan. The menu was going to be homemade pizza and wine! Sounded amazing! The bride to be had matching aprons made for her and her fiance. We did photos of all the prepping. We posed them together. Melissa drank some wine! They invited us to eat with them. As we had a bite, Neal looked out the window and said he wanted to do a photos from outside and through the window. We had the bride and groom to be, sitting at the table enjoying their wine. I stood in the doorway so I could relay direction from Neal to the couple. He wanted them to have a toast and cheers each other. This image looked so pretty! We loved that the back ground was their kitchen that they put so much work into to making it their own! Melissa and Joe had an amazing wedding the following summer. They had their ceremony at Holy Family of Jesus, Mary, and Joseph in Niagara Falls. For the photo session (idle), we went to a private residence along the water. Then the reception was at a private mansion near the Niagara Falls Country Club. They had a tent set up on the front lawn for cocktail hour. Then another massive then for the reception. Guests were then lead around to the back yard for yet another tent for dancing! It was awesome! Location: Niagara Scenic Pkwy, Niagara Falls, NY 14305.